Dental Services Des Plaines: My Dentist Says I Need A Mouthguard, Now What? If your dentist has recommended a mouthguard because you grind or clench your teeth while you sleep, you may be wondering how this dental contraption can help you. A mouthguard is a device that is placed in the mouth, oftentimes on top of the teeth, to help with grinding and clenching tendencies. Grinding implies moving your jaw back and forth, while clenching is biting down with pressure for an extended period of time. A nightguard can act as a protective barrier between your top and bottom teeth, so you don’t cause damage to your existing canines. 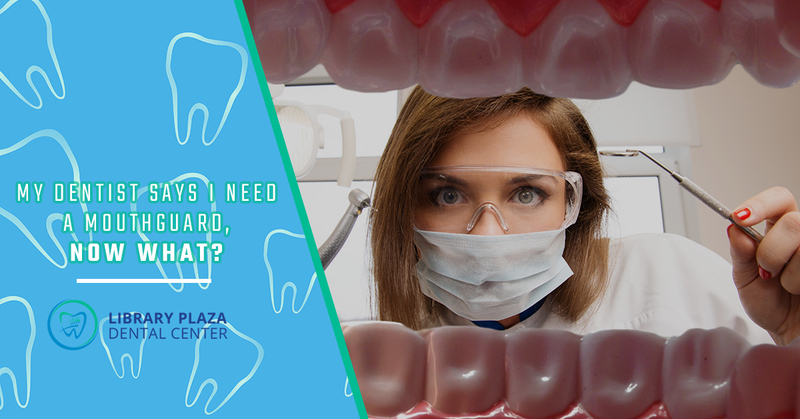 At Library Plaza Dental Center in Des Plaines, we’re proud to be a leading provider of general dentistry and cosmetic dentistry services throughout Illinois. If you’re concerned you or a loved one may be clenching or grinding their teeth at night, a mouthguard may be the best dental solution to prevent further tooth damage from occurring. Contact our friendly dental staff to schedule an appointment at our dental clinic today! If you frequently wake up with a sore jaw, a dull headache, or tooth pain, you may want to seek help from a qualified medical professional. There’s a good chance you’re suffering from the medical condition known as bruxism, which is a form of teeth fringing that affects about 10 to 15 percent of adults, according to the American Dental Association. According to Maria Clotilde Carra, a Doctor of Medicine in Dentistry at the Rothschild Hospital in Paris, people who suffer from bruxism grind their teeth at least two to four times per hour of sleep. When teeth grinding reaches this level of frequency, it can be diagnosed as a sleep disorder. While there are a few common ways to alleviate the effects of bruxism, your dentist may recommend a nightguard. 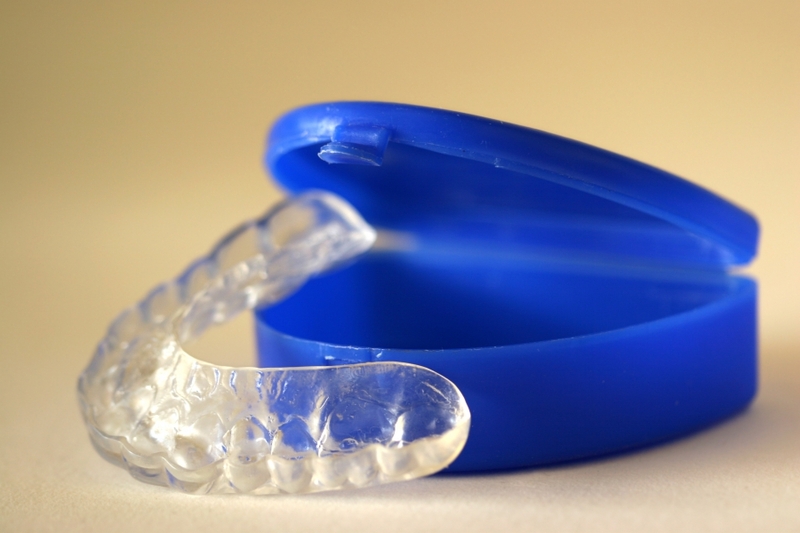 This appliance is often worn during the night while you sleep, and while you can pick a nightguard up at your local pharmacy without a prescription, it’s always best to get a custom mouthguard from your local dentist. When you visit your dentist, they will work with you to create a custom-made mouthguard that fits your mouth and teeth like a glove. These mouthguards are made using a mold of your teeth before they are sent to a special laboratory for production. Most of the time, these mouthguards are made out of a hard durable plastic and they are fitted on the top and bottom of the teeth. While a custom mouthguard will be a bit more pricey than over-the-counter models, they tend to last a very long time. Custom mouthguards are also a favorite because they offer the best protection against grinding. When you first receive your mouthguard, it will take some time to get used to. The very first week you wear it, you may feel a slight discomfort in your mouth and teeth as you adjust to it. After a week or two of regular wear, your mouth will get used to the shape of the mouthguard and it shouldn’t cause any more discomfort. Are There Ways to Reduce the Symptoms Of Bruxism? Yes! There are ways to reduce the symptoms of bruxism. Bruxism exercises are meant to address both the cause and effect of grinding your teeth during the day and at night. When you practice awareness exercises, for example, you can help decipher which triggers cause you to clench your teeth. Triggers can include stress, anger, and even boredom. When you make a point to focus on the position of your tongue and teeth, it can help to prevent these painful symptoms. When you feel your jaw clenching up, consciously place your tongue against the backs of your top teeth. This will make it impossible to start grinding. Once you become aware of your personal triggers, you can stay ahead of your grinding habits. Tension in the jaw is another bruxism cause that can lead to headaches, earaches, and jaw aches in the jaw joint. The best way to manage this discomfort is to relax your jaw muscles anytime you feel your face or jaw tensing up. Other ways to relieve jaw tension include massages, stretching exercises, and certain forms of physical therapy. If you’re concerned that you or a loved one suffers from bruxism, contact the friendly dental staff at Library Plaza Dental Center today. When you visit our state-of-the-art dental facility, we’ll take the time to thoroughly examine your mouth, teeth, and gums before recommending the best dental treatment for you. If our dental experts find that you are indeed suffering from bruxism, we’ll work with you to create a customized mouthguard to help safeguard your teeth from constant wear and tear. Schedule an appointment at our dental facility today!